This forum post on DPReview poses an interesting question on what the main differences are when it comes to comparing the editing and management of images using either a combination of Adobe Photoshop (PS) and Bridge (which comes free with the Photoshop installation), or using Adobe Lightroom (LR) alone. Workflow is a term used to define how an image gets from the camera to the final output and all the steps in between. The real issue is that Bridge is not a digital asset manager. It can help you import your images into a folder hierarchy you set up and manage yourself, and it can help you add metadata to your images for searching. But it can only basically “see” one folder at a time. And if you want to “process” a RAW image, you have to “open” it into Photoshop. Once in Photoshop, you have to save the resultant image out as some proper image format such as JPEG or TIFF. The “Workflow” is a little clumsy. 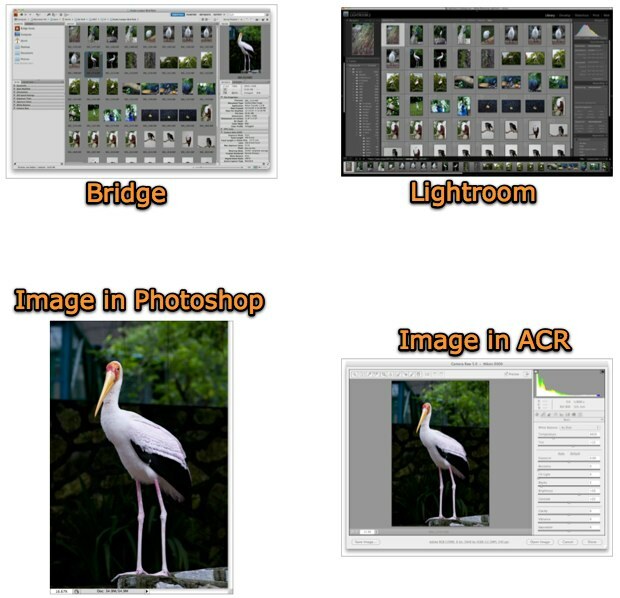 Lightroom, or Aperture on the Mac serve as a replacement for Bridge and ACR (Adobe Camera RAW). They allow you to work completely non-destructively, without ever having to “save” an image unless you move it into Photoshop for further processing. They do a much more robust job of keeping track of your complete image library, Workflow — Image imported with added Metadata into the Library of LR or Aperture, files sorted, rated, deleted, files adjusted, some, but not all files sent to Photoshop as TIFF copies for further pixel editing, then saved back into LR or Aperture with one click (copies are stacked with the original), then images are put into a Web Gallery, Printed, or output some other way for other uses. All inside of LR or Aperture. Seems like every day you meet people who don’t realize practically the entire Lightroom develop module is in Camera Raw. The Adjustment Brush is in Camera Raw and so is the Gradient Mask. CS4 went a long way in making Bridge almost as good as Lightroom in some ways. Unfortunately ACR is still stuck inside a dialog box. I work way faster in Lightroom than in Bridge / ACR. One program instead of three, and almost no dialog boxes in Lightroom, just a flat working environment. The keyboard shortcuts are simpler, better and faster. With one or two images Bridge / ACR is just as good. But when processing 400 images right off a card, Lightroom blows away Bridge / ACR in efficiency. LR is a more integrated tool, providing a better workflow than Bridge / ACR. Workflow, or in other words, the steps needed to take images from their initial state, cull, keyword, categorize and adjust the images, getting them ready for print. LR provides a better integrated tighter workflow than Bridge / ACR. I also recall that LR provides better support in the keyword aspect, I forget the details, it was in one of the LightRoom books I read. Lightroom was built from the ground up for the photographer, providing non-destructive editing, superior organization and categorization of your images. Its editing capabilities is such that I rarely need to go into PS now. Try it out and see if its a tool that fits your needs. All pro apps store keywords as standard IPTC. If you add keywords in either Bridge or Lightroom, they will show up in the other program, as well as in Photoshop, iPhoto, the Finder, in Windows apps, etc. and if you upload with keywords to Flickr, SmugMug, etc, the IPTC keywords in the file show up ready to go there too. You should be able to keyword once and read from many places. You do need to tell Lightroom to move keywords from its database to the files, either automatically or on demand. Once in the files, though, it’s all standard. In other words you use only one photo file and Lightroom handles the requirements for inkjet / contone printing and screen displays, for halftone reproduction Photoshop would still be used. This could be Lightroom’s (version 2.3 or higher ) biggest selling point yet never seems to be mentioned in any of the forums or print material. Mr. Schewe’s book is the first one that really promotes this feature and then demonstrates its usefulness. For me, I really like the Lightroom’s printing feature which allows me to place four 4 x 6 images on a single A4 paper in a standard layout. See the last two images in my post on the Canon iP4500 printer to get an idea what I’m talking about. Lightroom conveniently allows virtually any combination of paper size and number of images per page. If Bridge, ACR and CS4 work for you and you are happy with the results and your workflow, then that’s great and you don’t need LR2. The big thing for me workflow speed. Photography is my hobby so I don’t have as much time for it as I would like. LR2 helps me work faster and smarter which adds significant value for me. Your mileage may vary as they say. There’s almost no proper way to explain it to the uninitiated. You have to download the LR demo and jump in. Not just pick at a few photos — go whole hog for a couple of weeks. After that period, any doubts ought to be erased. Since I started using it last year, Lightroom has already given me hundreds of hours of my life back (I take photos for a living. your mileage may vary). In terms of workflow and efficiency, LR blows Bridge/ACR out of the water.